At work, for a very long time, we used our network provider’s cache server to serve our static files (mainly pictures). We wanted a real CDN (as in globally distributed) that would be both faster and cheaper. We chose to use the AWS S3+CloudFront combination. It was a true CDN, it was faster than another provider we trialled and we wouldn’t have to worry about the space used. The old cache server could only be accessed via FTP. We needed to be able to mirror the source to the destination. Because our staff and apps would continue to use the old cache server while we would be ramping up on S3, we didn’t want to retransfer all the files every day. Some of our directories contained several hundreds of thousands files. We needed a tool that could list these directories without crashing. We had approximately 90 GB in 3,3 million files to transfer. Taking days to transfer everything was not an option. After a little digging, I couldn’t find a single piece of software that could connect to the FTP and copy/transfer only the new/updated files on the fly to S3. It can transfer files in parallel, making it really fast. It can use several alternative methods to list directories, including one that can handle the very large directories without timing out or crashing. The mirror command works flawlessly, I tested it with several combinations of new/updated/deleted files. It keeps the original file timestamps. It took approximately 7 hours to transfer all the FTP files to the EC2 instance. I used s3-parallel-put for the same reasons I used lftp: reliable, fast thanks to parallelism and able to handle very large directories. python s3-parallel-put --bucket=BUCKET_NAME --secure --put=update --processes=30 --content-type=guess --log-filename=/tmp/s3pp.log . First I export my AWS credentials in environment variables because s3-parallel-put needs the values this way. using the content-type=guess option: it allows s3-parallel-put to specify the file type while uploading (it can only detect pictures, but that’s what I was uploading). It’s important because otherwise AWS doesn’t send the right HTTP header to the browser, and when accessed directly a picture is downloaded instead of being shown in the browser. The EC2 instance being in the same region of my S3 bucket, the initial upload was blazing fast and took only 1.5 hours. The initial “snapshot” of the FTP to S3 took long, but then mirroring the FTP locally and mirroring to S3 took only the time to traverse all directories to detect and download the changed files — in my case: 35+38 minutes. I made a small shell script combining the two commands, and scheduled it twice a day. There is an intriguing option to the mirror command of lftp: on-change. It seems that if lftp detects a change, it can launch a shell script. what does a “change” mean? Updated file? New file also? is the script launched for each changed file or more globally at the end of the mirror? what parameters are passed to the shell script? By quickly browsing the lftp source code, it seems that the script is launched at the end of the mirror. In my case, it would have been more interesting if it were launched for each modified file: I could have used an S3 file uploader to upload each new/modified file individually. Maybe in a future version, or — if I dare dive into C++ again — in a pull-request! Live video feed through thin glasses! In the air! 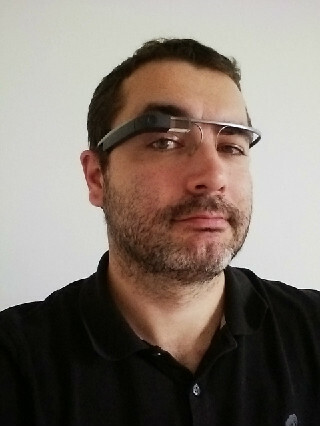 I now own a Google Glass (by the way, please don’t say “glasses”, it has only one glass). Being a so-called “Glass Explorer”, I chose to wear it all day, every day. I wear it at work but also outside, in the streets, in the subway, in stores, at home. Basically, if I’m awake, I wear Glass. You look silly with it! Can you think of another device that can spark such a variety of reactions, from enthusiastic to defiant? How cool is that? And it’s really exciting to be part of the future-shaping, society-redefining community of Glass Explorers. Oh, and did I mention that you can take pictures of your cat with it? It can’t record everything you do continuously. The battery is just not capable of it. It can’t do facial recognition. Google forbids this kind of app. Of course, there will be unofficial apps that will do it anyways. I can’t see you naked through it. Just like there is no such thing as a “naked scanner” you can download for 1€ on your phone. Guys, seriously! So, what can you do with Glass? Glass is not always on. You have to activate it to see something on the screen. To do this, you just tap on the side, or turn your head up. You then see a screen showing the time. There you can either navigate on your timeline and see what you have done with Glass in the past, or you can speak an order. Yes, Glass is able to do voice recognition (english only for the moment). So you can say “take a picture” and voilà, it just took a picture of what you’re looking at. You can do a google search, and the most relevant result will be printed on the screen AND spoken in your ear. Take a picture, in a fraction of time you would need to pull your smartphone out of your pocket. Record a video. In my personal experience, you can shoot about 20 minutes of video before the battery runs out. Search via Google. Just speak what you are looking for and a nice female voice will read you the answer. It tends to give a wikipedia abstract often. Make a phone call. Glass is connected to your smartphone via Bluetooth, so it becomes a hands-free headset. You can initiate or answer a call from Glass, no need to take your phone out of your pocket. And you can see who is calling, of course. Send a message (hangout, SMS, tweet, Facebook status). Voice recognition again, so english only, but it works well. Receive notifications of a new email, SMS, tweet or Facebook message. You hear a sound, and you have to activate Glass to see the notification on the screen. Get directions via the GPS you have in your phone. Speak a destination and the step-by-step directions are shown on the screen. Battery killer. Listen to music. You have to have a Google Play Music account and you hear it on the right ear only. Not the best experience. But, what about your phone? I have a the best phone on Earth. Try to shoot a video of a ride on bike with your daughter with a smartphone. Glass is about not getting in the way, and being able to fully live an experience while recording and sharing it with others. This post is the instructions list I followed to install Gentoo on my new work laptop: an HP Folio 9470m. It’s a mix of the official Installing Gentoo handbook, @ultrabug’s french install guide and various resources I found while googling for this specific laptop. This is mostly intended to be a reminder to future-me, but I’d be more than happy if it’s useful to someone else. If so, let me know by writing a comment! Tip: if the default was loaded before you could change it, and want to get (e.g.) the french layout, type loadkeys fr once you are in the shell. Verify that your clock is correct by typing date. It indicates that wpa_supplicant is installed and that you need to provide it with a valid config file. An iwconfig should show that you are connected to your SSID, and an ifconfig should show your IP address. To verify that you really have Internet access, type ping -c 3 www.google.com to see the pings. Delete all the existing partitions (if any). Type d and the partition number. All set, you’ll now start to configure your final Gentoo system. Tip: You are better off not choosing a nomultilib file if you want maximum compatibility. Tip: You can choose a closer mirror to download the stage3. To download and install the latest portage snapshot, the easiest way is to use emerge-webrsync. From now on, everything you do is in your final system, not on the LiveCD. The portage profile aims to pre-fill USE flags. Since this is a laptop and you want some graphical UI, choose the desktop profile. First, type eselect profile list to see the list of available profiles. Then type eselect profile set X where X is the desktop profile. First, type eselect python list to see the list of available python versions. Then type eselect python set X where X is the your prefered version. This laptop has an Intel Core i7-3687U CPU. It’s an IvyBridge and as of gcc-4.7, its march is core-avx-i. USE="bindist mmx sse sse2 -ipv6 -kde -gnome xinerama v4l -llvm -llvm-shared-libs"
ACCEPT_KEYWORDS="~amd64" # yes, we will accept unstable packages! Crazy us! If you need to know which CFLAGS you should use with a different processor, you can go to the Gentoo wiki. You need to specify which locales you want on your system. You then have to run locale-gen to generate all the specified locales. If you live somewhere else, check /usr/share/zoneinfo for a list of all the supported timezones. Because you changed your portage profile and chose to enable unstable packages, it’s good to launch a global update of the system. All “mandatory” packages will thus be installed. There is a very involving process where you can choose every single piece of code that goes into your kernel, and there is a simple one, where you don’t have to decide anything. This is what you’ll choose here, and because the genkernel tool takes its config from what was detected at the LiveCD boot, your kernel will mostly be optimized for your laptop. Your partitions are listed in /etc/fstab. Gentoo provides a default file that is not valid and must be modified. Note the discard option for our root partition: since it’s on an SSD and the fs is ext4, this will enable the TRIM command. Also: there is no cdrom drive on this laptop, so no need to write an entry in the fstab. Now, you will install and configure wpa_supplicant to enable wireless networking. config_wlo1="dhcp" # wireless interface for this laptop. Run ifconfig to see yours. config_enp0s25="dhcp" # lan interface for this laptop. Run ifconfig to see yours. edit the /etc/conf.d/hwclock file and set it to “UTC” “or “local” depending on your BIOS setting. If you came from or dual-boot with Windows, it will be “local”. Just type passwd. This is the root password. You know what it means. metalog will be your system logger. To install it, type emerge metalog && rc-update add metalog default. You now have a working Gentoo distribution installed on your laptop. It’s time to configure it further. You will now configure some settings, like the keyboard layout or the touchpad functions. First, if it does not exist already, create the /etc/X11/xorg.conf.d directory. You can find the list of available options in the man synaptics page. You’ll need to modify the /etc/slim.conf file to set the login_cmd to the line login_cmd exec /bin/bash -login ~/.xinitrc %session and comment the 2 others. If you are in an X session, your video should show. Otherwise, you should see a frame counter rolling. That’s good. Everything should work now - mostly. Of course, there is still some tweaking left! In an upcoming post, I’ll detail the exact config files I used for this hardware, including for the kernel. When I first heard about iBeacons, I thought it would be a great idea to build one. It seemed doable for an ex-developer-would-like-to-code-again-but-doesn-t-have-a-lot-of-spare-time like me. So I grabbed my Rapsberry Pi, and found a couple of articles describing how to make an iBeacon out of it. Unfortunately, none would tell exactly what I wanted: a simple service launched at boot, easy enough to configure, with no complicated C code. The first article I read is from Radius Networks. They seem to have developped a comprehensive platform enabling marketers to do a lot of location-based things in their apps. The post is almost exactly what I was looking for, except that for some reason their Bluetooth commands didn’t work with my adapter. In the second article from Carson McDonald, the iBeacon part is a C program. It worked instantly with my adapter, but I didn’t want to dive into C code to maintain it, should I need/want to. So I kind of reverse-engineered the C program with a bluetooth debugger, to see exactly what commands were transmitted to the adapter. Combining thes two articles, I was able to determine the commands compatible with my adapter and put together a fully autonomous PiBeacon. This is what worked for me. Everything is on my github repo. a Raspberry Pi. I had the B model in hand, but the A model should work just the same. an SD Card for the system. Any will do as long as it’s at least 4GB. a Bluetooth 4.0 dongle. I chose the Inatek BTA-CSR4B5 because it’s tiny, affordable and its chipset (CSR8510) is known to work well with Linux. You can find a list of tested Bluetooth adapters at eLinux.org. Nothing fancy here, download the official Wheezy Raspbian, and write it on the SD Card. Plug the Bluetooth dongle, boot the raspi and log in. Verify that your Bluetooth dongle is recognized: type hciconfig to see if your device is listed. It will most probably be named hci0. If you don’t see “UP RUNNING”, type sudo hciconfig hci0 up. Now that the Raspi is fully installed, we can transform it into an iBeacon. We only use programs that are part of the BlueZ stack: hciconfig and hcitool. For convenience, create a directory named iBeacon in /home/pi, and put these three files there. Since you could have several iBeacons in the same place, this file contains the values enabling us to identify an iBeacon. You can change major/minor values at your linking. The iBeacon should start advertising (broadcasting) its identifiers. Of course, your device has to be Bluetooth 4.0 capable. echo "Please start the script as root or sudo!" sed "s:/home/pi/iBeacon:$(dirname $(readlink -f $0)):" > /etc/init.d/ibeacon << "EOF"
update-rc.d -f ibeacon start 80 2 3 4 5 . stop 30 0 1 6 . Now sudo ibeacon_install_service.sh to install the ibeacon service. The ibeacon service starts automatically when the raspi boots. You can also start/stop it manually by typing sudo /etc/init.d/ibeacon start and sudo /etc/init.d/ibeacon stop. Congratulations, you now have a fully autonomous PiBeacon! If you want to know a little more about iBeacons and what you can do with it, you can read this post by Dave Addey. This blog and this post are long overdue. I thought about starting blogging several times in the past ten years. And the time is now. I’ve bought a Raspberry Pi when it was announced. Like many of my other geeky stuff, I’ve turned it on for a day or two, and then it has collected dust in a drawer. Since this first project, I’ve found other stuff to hack about, regarding one of my hobbies: home automation. This domain has changed a lot these past years, largely due to the opening of communication protocols (X10, Z-Wave, 433MHz) and the emergence of small hacking platforms like the Arduino, the Raspberry Pi and the Beagle Board. Being able to watch and control parts of your house is now at your fingertips – literally, with a smartphone. This is mainly what I’ll be writing about: my attempts to know better and manage my home from afar. Er, “hack and cheese”, srsly ? I could tell you that I love to hack and I love cheese. It’s true. But no. I just love cheesy puns.